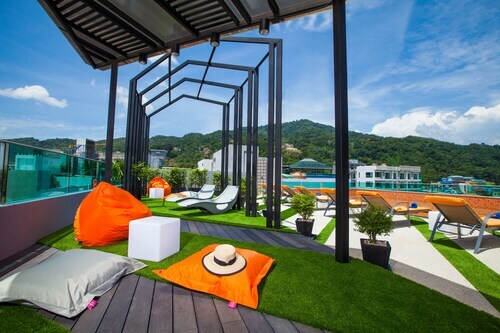 Situated by the sea, this hotel is within 1 mi (2 km) of Patong Boxing Stadium and Patong Beach. Jungceylon Shopping Center is 1.3 mi (2.1 km) away. 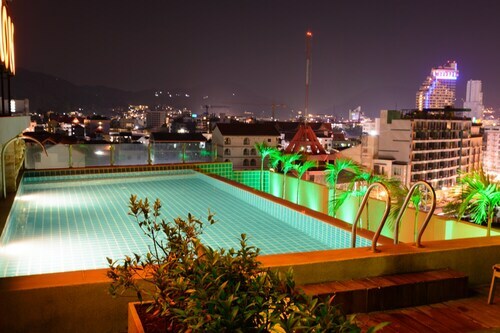 Located in the heart of Patong, this hotel is within a 15-minute walk of Patong Boxing Stadium and Patong Beach. Jungceylon Shopping Center is 0.9 mi (1.4 km) away. 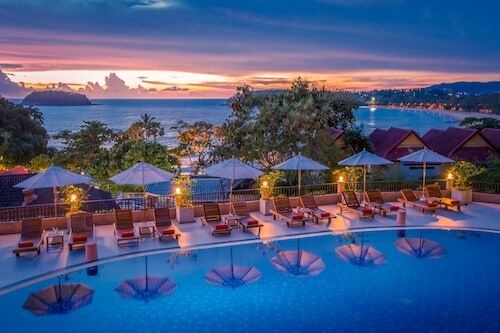 Situated by the ocean, this spa hotel is within 1 mi (2 km) of Karon Temple and Karon Beach. Kata Beach and Kata Noi Beach are also within 3 mi (5 km). 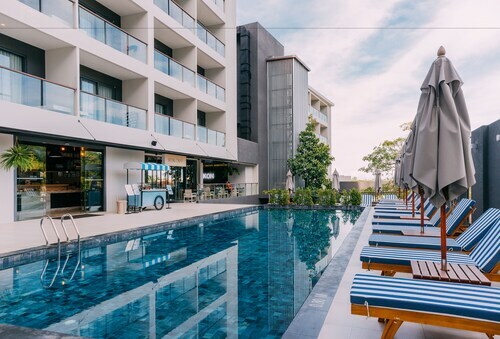 Located in the heart of Patong, this hotel is within a 5-minute walk of Bangla Boxing Stadium and Jungceylon Shopping Center. Patong Beach and Karon Beach are also within 3 mi (5 km). 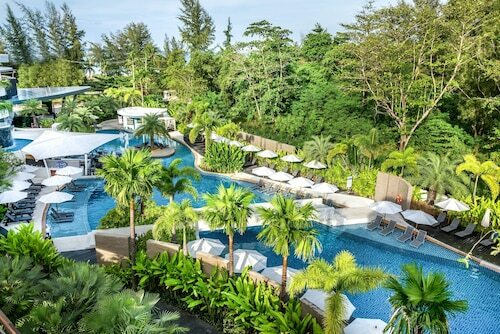 Located in Wichit, this beachfront resort is in a national park and within 3 mi (5 km) of Phuket Aquarium, Panwa Beach, and Chalong Bay. Suan Luang Park and Khao Khad Views Tower are also within 6 mi (10 km). 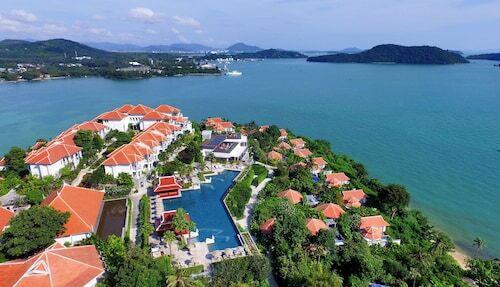 The Slate, formerly Indigo Pearl, an award-winning luxury boutique resort, opened in 2007 with 177 rooms and touches Nai Yang Beach on the North West shore. 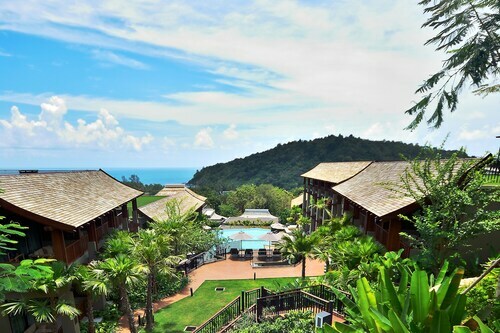 How Much is a Hotel Room in Phuket? 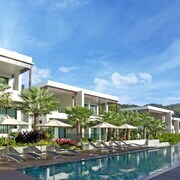 Hotels in Phuket start at C$34 per night. Prices and availability subject to change. Additional terms may apply. Welcome to Phuket, Thailand's largest island. 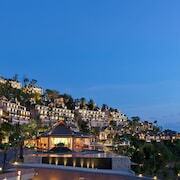 Few places in the world can compare in beauty to this Southeast Asia destination. 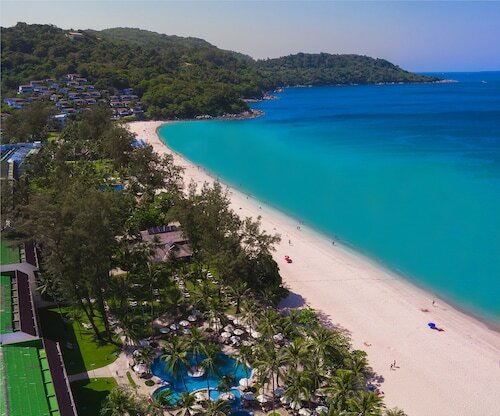 Facing the pristine Andaman Sea, Phuket (the "h" is silent) wows with an incredible culinary scene, nonstop partying, outdoor activities, world-class beaches, and all the watersports known to man. Needless to say, you'll be entertained from start to finish. 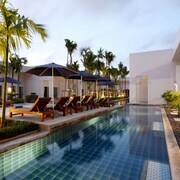 Search for Phuket hotels, and come play in one of the world's greatest vacation spots. 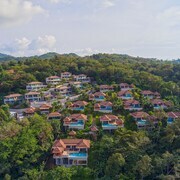 From enjoying the comforts of the best hotels in Phuket to visiting Wat Chalong (a Buddhist temple), you have a wide array of activities to enjoy. 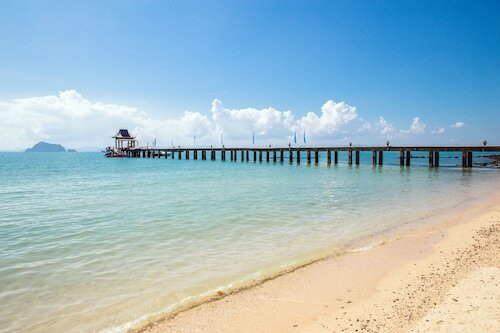 Go sea canoeing in Phang Nga Bay, kite surf in Nai Yang, or sail and sunbathe at Nai Harn Beach. Get a lesson in preservation at the eye-opening Gibbon Rehabilitation Project, or make the trip to the Phuket Big Buddha, a truly stunning sight. If it rains, don't despair. Sights like the Phuket Trickeye Museum please year-round. 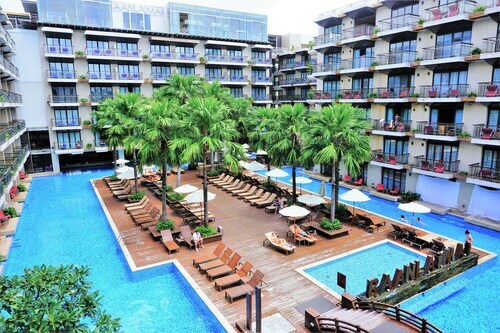 As you look for Phuket hotels, consider what you want to do and see, as the island is large. Certain spots are great for exploring culture, while other suit those who want to party. You'll come across cashews and pineapples throughout the island, undoubtedly worth a try. You'll see many local noodle dishes too, which taste delightful, as does the fresh seafood. If you're staying at a resort, you'll have bars and international cuisine onsite. Patong stands out when it comes to dining and partying -- in fact, it's arguably the most entertaining place in southeast Asia. 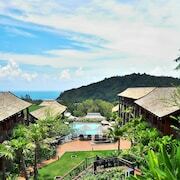 Start planning early on Travelocity by looking for flights and luxury hotels in Phuket. 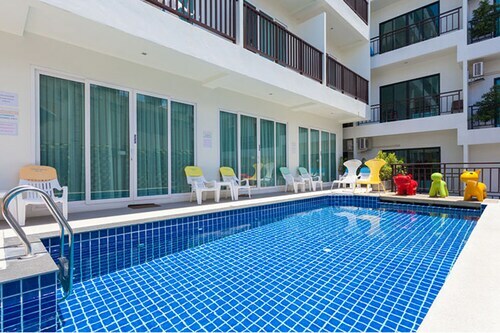 From hotels near Karon Beach to lodging by Banana Beach, you'll find tons of prime properties here. Save more with exclusive mobile deals on the Travelocity app. We loved how open and spacious it was. There was SO much to do all over in the hotel alone which was really great and comforting. Plus, all of the pools were really great as well. Absolutely awesome service! The hotel is centrally located.... close to shopping areas and the beach! While it's not a 5-star facility.... the Service is definitely 5-star! I would certainly recommend this hotel! This is a really new hotel and it shows. Very little wear and tear on anything. Really only 3 issues I saw. 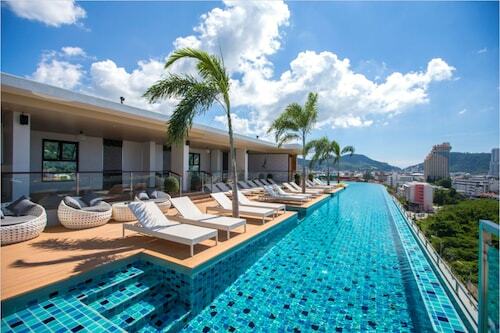 1 - getting a seat near the pool. People lay towels out first thing in the morning and regardless if they are at the pool or not. Nearly impossible to find a chair after lunch. (as a plus, near the last day the hotel put a sign up about moving stuff off of the chairs if they are empty for 30 mins or more) 2- Towels. This might not be a problem for this hotel only, but getting clean towels was sort of a pain. Yes you'd get new ones each day, but only 2 room and 2 pool/beach per day. It would be nice if it was possible to have a few additional or the ability to get one on demand. 3 - Internet. For the most part it worked pretty darn well. However, there was one day it was out for the entire day. Also I don't know why, but we could not use facetime via there wifi. We could do facebook video calling, but not facetime. Almost wonder if they had a block on that for some reason or another. The only other thing I'd mention is we did have one weird experience I read on another persons review where at 10 in the morning everything just auto turns on via the room key that needs to be put in the power socket in order for the air to run. Woke us up that morning. Yes it was 10 a.m. and we should be up but we were out pretty late the night before. First the property is Magnificent. Absolutely beautiful and magnificent. What puts this resort into the paradise range are the employees. Dach, James and Mai at the pool bar who made me and my girlfriend feel at home, comfortable and well cared for, or Alek, the Restaurant Manager, who made us feel welcome and the rest of the Restaurant staff who provided such wonderful meals. Fantastic food, service we felt was superb. To all the wonderful staff behind the scenes and behind the counter, Jen, Fern, April, Lou, Nicole, John, Chulo, Ord, Kan, Orio and Max, I need to commend for the friendliness, professionalism and best customer service I have ever experienced in any 5 star hotel. 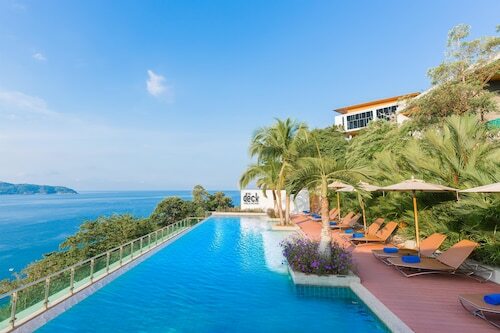 Truly the staff has clearly made my decision to stay at the Baan Laimai Beach Resort in Patong on every single future trip to Patong an easy one. Thank you all for such a wonderful experience you have provided me and my girlfriend. Excellent. My initial room wasn't up to my higher standards but receptionist worked with me to upgrade to a nice delux room for a bit more per day which was more than worth it. Excellent place in patong to stay and my room was a 5 star standard.